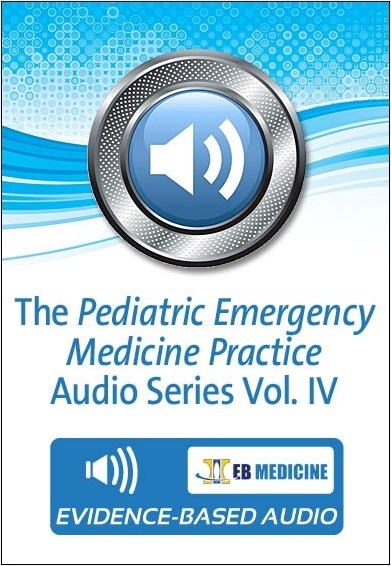 In volume IV of this audio series, Dr. Ilene Claudius reviews 4 topics covered in Pediatric Emergency Medicine Practice over the last year, and provides additional information to supplement the content provided in the issue. Each topic in this collection condenses the information you need to know into easily digestible sessions. You only need to spend approximately 20 minutes listening to each topic to learn what you need to know! The entire collection contains over an hour of evidence-based audio content and will give you recommendations that you can immediately begin applying to your practice. The Pediatric Emergency Medicine Practice Audio Series Vol. IV includes an MP3 download (available as soon as you complete your purchase). This audio summary provides a framework for patient management for clinicians who treat pediatric patients who present to the emergency department or urgent care clinic with sickle cell disease and for clinicians who may not have strategies in place to recognize sickle cell disease and crisis. The management of sickle cell disease must include assessment for other more malignant pathology, and additional diagnostic testing and treatment may be necessary based on the type of syndrome. This audio summary addresses the management caveats of vaso-occlusive crisis/pain crisis, acute chest syndrome, and sickle cell trait. Appropriate diagnostic testing and treatment strategies are presented. Treatments that are not recommended are also discussed. This audio summary is an outline of the techniques for venous access in pediatric patients for emergency clinicians and will aid clinicians who may not see pediatric patients on a regular basis. Venous access may be difficult to obtain in pediatric patients due to the relatively small size of the pediatric vasculature, as well as the pain and anxiety that may occur in pediatric patients. This audio summary covers the various methods of gaining vascular access in pediatric patients, with strategies to address difficult access, pain control, and clots. Controversies are also discussed. This audio summary is intended for emergency clinicians who treat pediatric patients presenting with orthopedic injuries. Assessment and management of pediatric orthopedic injuries can differ from management of these same types of injuries in adult patients, due to the more porous nature of pediatric bones as well as the presence of growth plates. This audio summary covers the assessment of upper and lower extremity bone and joint injuries, with a focus on the caveats of treatment of pediatric patients. Appropriate management strategies based on the type and location of the injury are reviewed. This audio summary is intended for emergency clinicians who treat pediatric patients presenting with wounds that require pain management and closure. The type of pain management and wound closure technique differs based on the type and location of the wound. This audio summary discusses methods for establishing rapport with the patient, pain management, and anxiolysis. Special considerations and cautions in wound closure techniques, such as sutures, hair apposition, and adhesive strips are discussed. Time- and cost-effective strategies are reviewed as well.